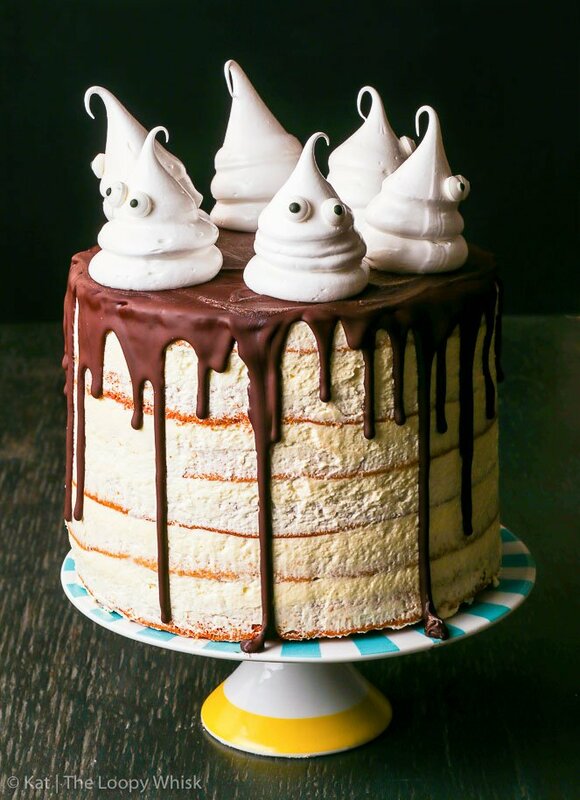 This gluten free Halloween cake is what happens when a checkerboard cake meets a spooky ghost cake. 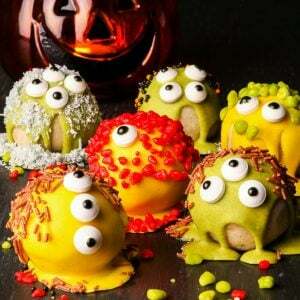 It’s surprisingly easy to make, and it will certainly be the centrepiece at any Halloween party. 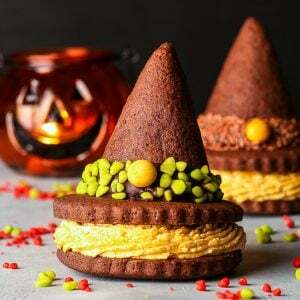 The perfect gluten free Halloween treat, with a dairy free option! 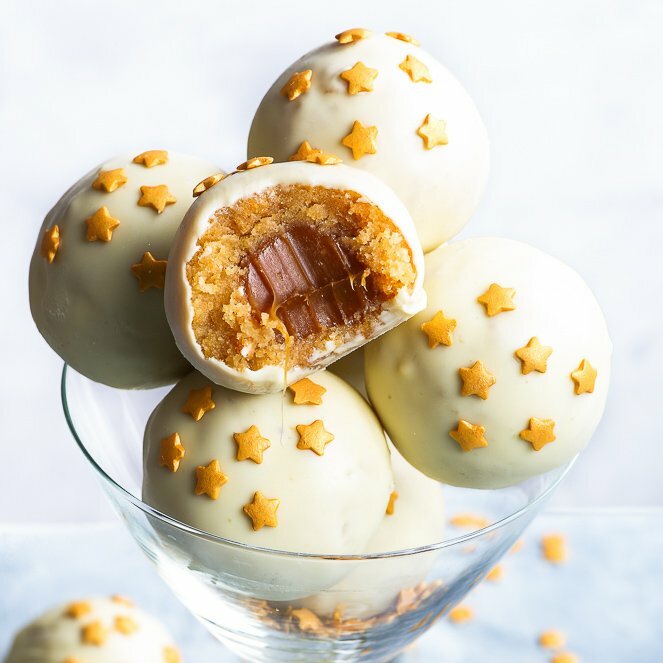 Sometimes, Chemistry and baking collide in the most spectacularly unexpected (and amazing) ways. Take this gluten free Halloween cake, for example. Believe it or not, this was initially meant to be a “bumblebee cake”. I know. How on Earth did I end up with a spookalicious cake complete with marshmallow ghosts?! Well, the “bumblebee cake” was supposed to be a dark brown + yellow checkerboard cake – 100% naturally died, of course. The dark brown sponge would get its colour from chocolate and cocoa powder (YUUUM), and the yellow sponge would have turmeric added to it. So there I am, mixing this almost fluorescent yellow cake batter (no, seriously, check out the video below! ), feeling mighty pleased with myself. You can’t really taste the turmeric, just a gentle undertone. That’s good. The yellow is so intense it could knock your socks off. That’s great. It comes out of the oven, smelling all tempting and mouthwatering and yummy. Brilliant. And then I go to level off the top, remove the cut-off… and it’s red?! I’m sorry. Say WHAAAAA???? 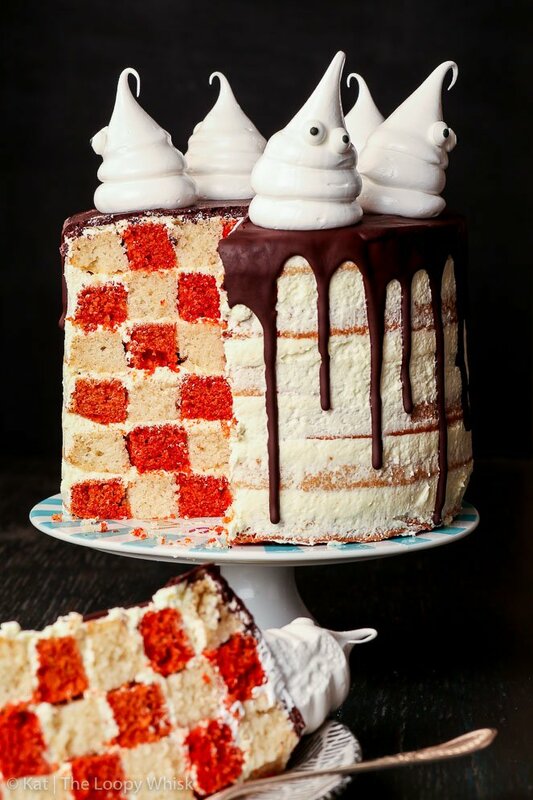 So, instead, this red and white checkerboard cake was created. 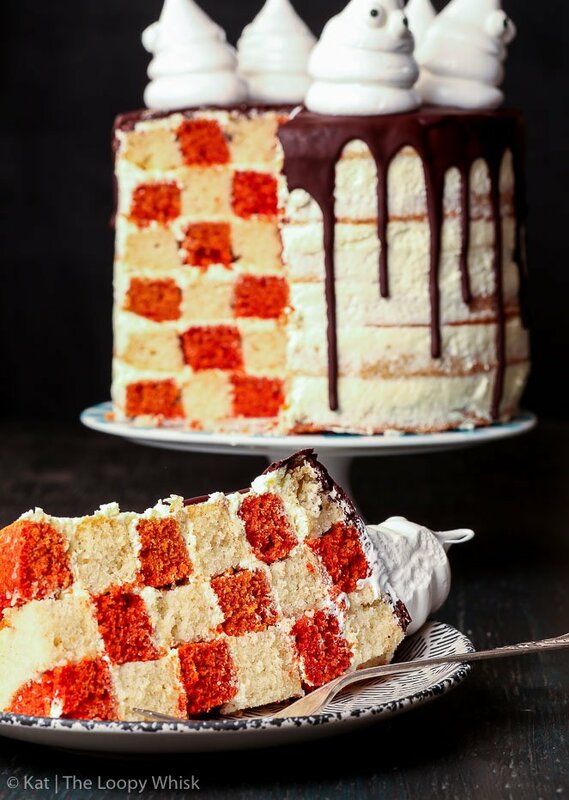 And because if you squint (and have a weird brain, like yours truly), red and white can remind you of blood and bones (I’ve spent waaay too long pondering Halloween lately – clearly), a Halloween checkerboard cake was created instead. And not just any old Halloween cake! 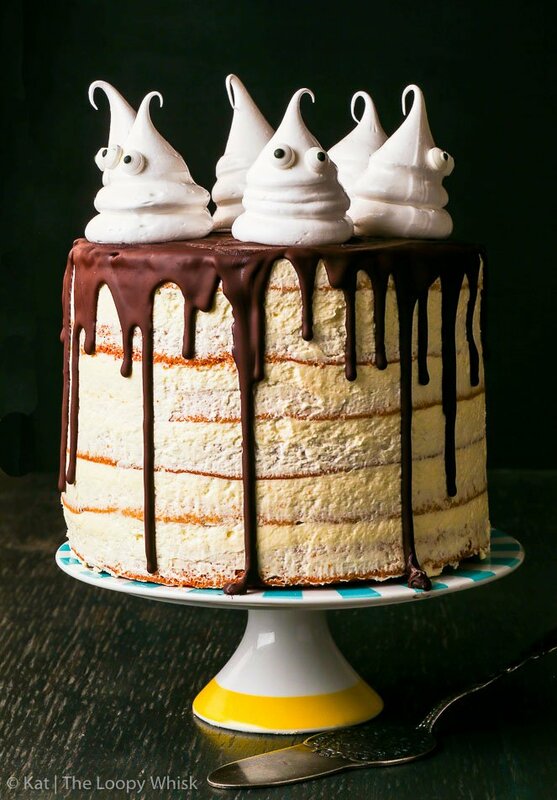 It’s a checkerboard gluten free Halloween cake with MARSHMALLOW GHOSTS! Seriously folks, how amazing is that?! And, yes, everything is from scratch – including the gluten free sponge, swiss buttercream frosting AND the marshmallow ghosts. No cake mixes, frostings-from-a-can (those things apparently exist) or marshmallows in sight. 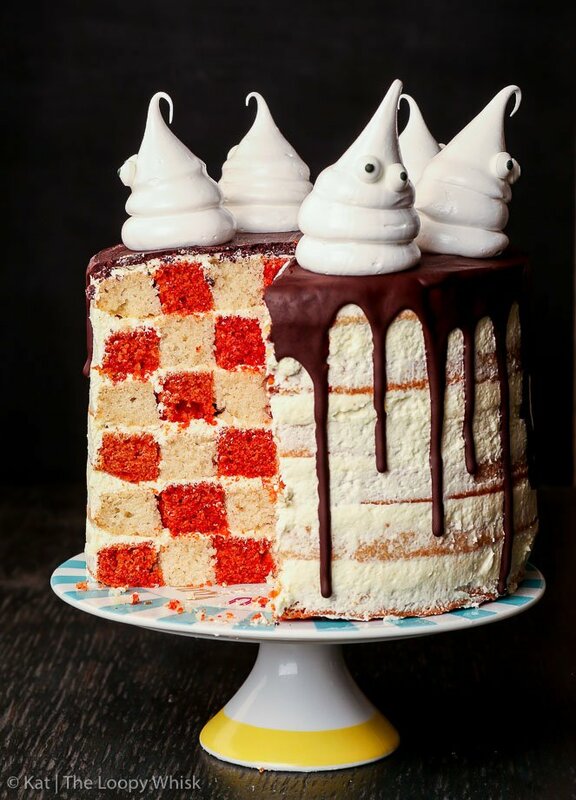 Now, you might think a checkerboard cake pattern is ridiculously difficult to achieve. Nope, not at all! It couldn’t be easier. All you do is cut out rings of the two coloured sponges, and then mix the two colours together. For a much better explanation, just check out the video below! And to make life even easier, I’ve made you a little template to use – it’s for a ~6 1/2 inch cake, so if you use another cake tin size, you’ll need to “resize” it. But it will give you a good idea of how to cut up your sponges. 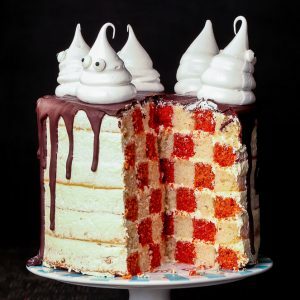 Click here for the checkerboard cake template! 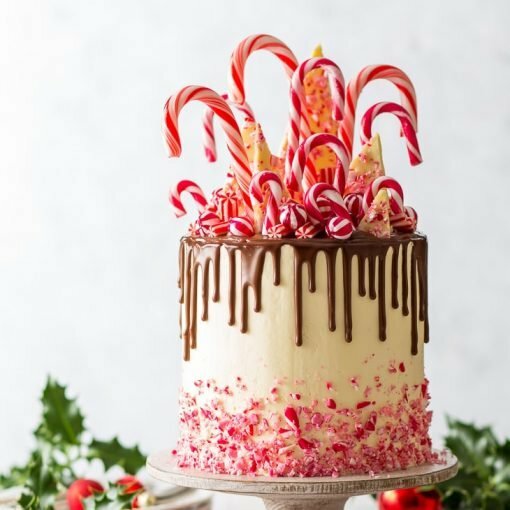 The frosting I’ve used for this cake is swiss meringue buttercream. I actually prefer it to the “standard” buttercream (that is, the one that is just butter + powdered sugar) because it’s fluffier, more velvety and somehow also not as sweet. It’s also perfect for piping and cake frosting. If you’ve never made it before, swiss meringue buttercream (or just “swiss buttercream”) is made by first whipping up what I like to call “marshmallow meringue”. You heat egg whites, caster sugar and a pinch of cream of tartar (for stability) over a pot of simmering water up to about 150 ºF (65 ºC), at which point the sugar has dissolved and the egg whites are safe to eat. Then you transfer it into a stand mixer (you can also use a hand mixer) and whisk whisk whisk until increased in volume, white, fluffy, room temperature and ABSOLUTELY DELICIOUS. It’s basically soft marshmallows. Then you go and throw a bunch of softened butter in there. It will feel weird (much like crumbling the cake sponge did, remember?) but it will result in the most amazing buttercream. Trust me. 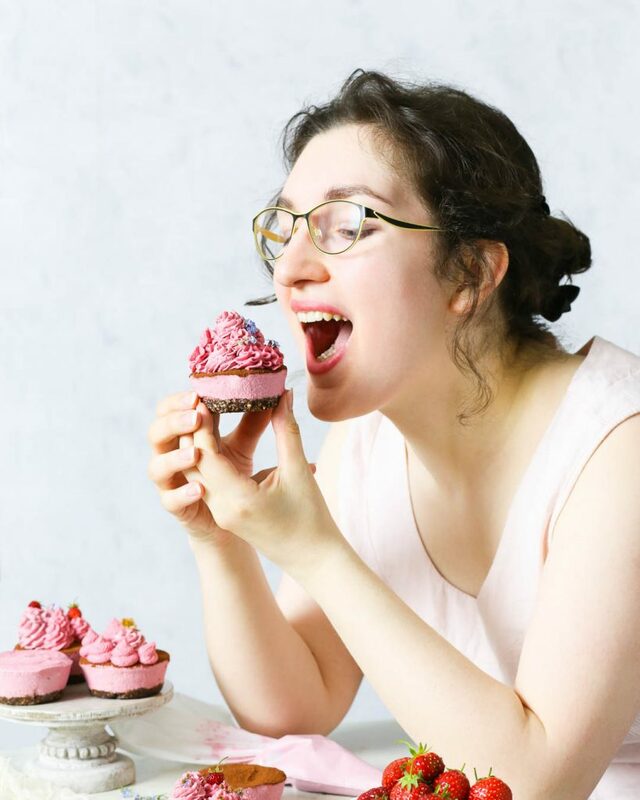 And you can totally go the dairy free route by subbing in a vegan/dairy free butter substitute instead of the “normal” butter in the frosting. I went with the “naked cake” look, where you can still see the sponge through the frosting. 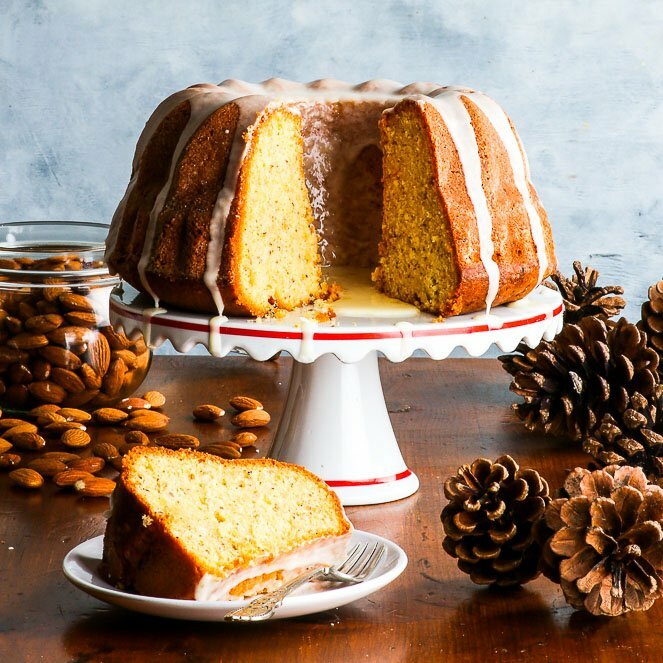 I like the rustic vibe – but you can definitely increase the amount of frosting and go for a “cleaner” finish with the whole cake completely covered. Because life would be a sad place without chocolate, we’ll drizzle melted dark chocolate on top and let it drip down the sides in the most decadent way imaginable. Remember the marshmallow meringue we made for the swiss meringue buttercream? We’ll just repeat the first part (that is, no butter here), and then pipe the amazing wonderful fluffy delicious marshmallow meringue with a big round nozzle on top of the chocolate. Add some candy eyes, and voila! You have marshmallow ghosts. Easy peasy. Sometimes, unexpected “complications” lead to the most wonderful things. 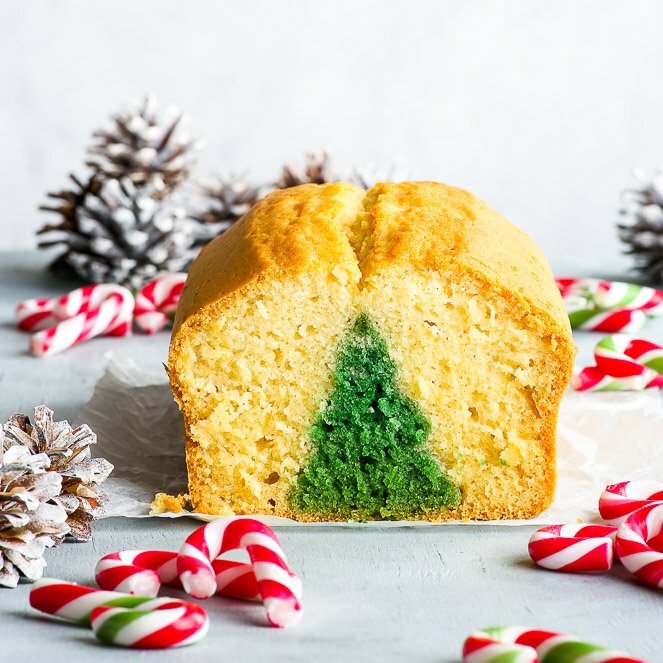 While a bumblebee cake would be a-h-mazing (and will definitely make an appearance on the blog at some point), how could anyone possibly be disappointed when this gluten free Halloween cake is the result?! So next time life hands you red when you expect yellow – don’t complain and mope around. Change your plan, adapt, and embrace the red – the different, the unexpected, the complication. It just might lead you to something amazing. Pre-heat the oven to 355 ºF (180 ºC) and grease round cake tins with butter (I've used 6 1/2 inch cake tins). You can also line the bottom of the cake tins with greaseproof/baking paper. In a bowl, mix together all wet ingredients. Sift together the dry ingredients (leave out the turmeric powder for the white sponge) and add them to the wet ingredients. Mix well until you get a smooth batter with no flour clumps. Transfer the batter into the greased (and/or lined) cake tins, until ~3/4 full. Bake in the pre-heated oven at 355 ºF (180 ºC) for 20 to 22 minutes or until golden on top, springy to touch and an inserted toothpick comes out clean. In a heat-proof bowl above a pot of simmering water, mix together egg whites, caster sugar and cream of tartar. Heat until the mixture reaches 150 ºF (65 ºC), at which point the sugar should have dissolved and the egg whites are safe to eat. Immediately after the mixture reaches 150 ºF (65 ºC), transfer it into a stand mixer (you can also use a hand mixer) and whisk the mixture on high speed until it cools down to room temperature. It will become white, fluffy and will greatly increase in volume. The marshmallow meringue is done when it forms stiff, glossy peaks. Once the meringue reaches room temperature, add the softened butter, ~1 tbsp at a time, all the while whisking at medium-high speed. After all butter has been added, whisk for a further 5 to 10 minutes, until you get a soft, smooth buttercream that holds it shape well. Using the template (get it above – if you're using a different cake tin size, adjust it accordingly), cut out rings of the sponges. Place the cut out rings inside one another, alternating the colours. Repeat until you have 6 sponges with rings of alternating colour. Place the first sponge layer on a cake stand and spread a thin layer of swiss meringue buttercream on top. Add the second sponge layer, cover with a thin layer of buttercream, and repeat until you have a cake 6 sponge layers thick. Use the rest of the swiss meringue buttercream to frost the outside of the cake, creating a "naked cake" look. Chill the frosted cake in the fridge for about 15 minutes. Drizzle the sides of the cake with melted chocolate, so that you get a "dripping cake" look. Use the rest of the melted chocolate to create a smooth chocolate top. 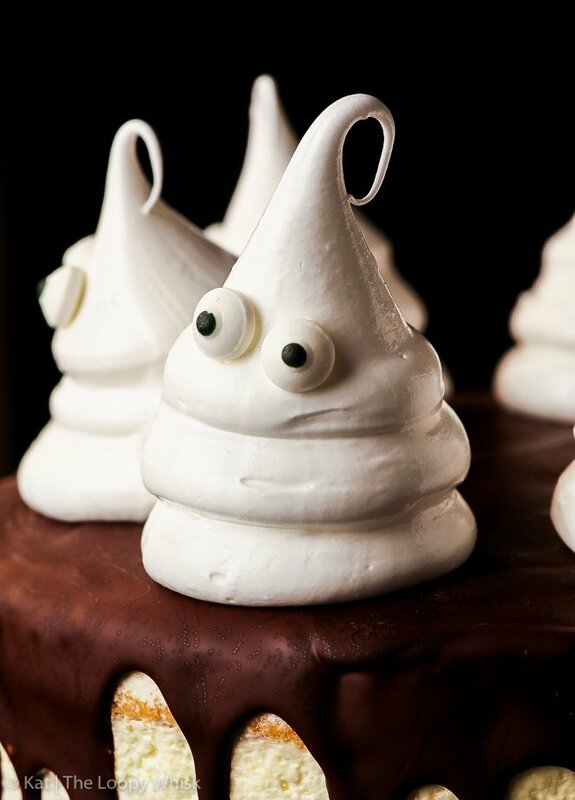 Using a piping bag with a big round nozzle to pipe marshmallow ghosts on top of the cake. Decorate them with candy eyes. That's it! Tuck in and enjoy! The gluten free Halloween cake keeps well in a closed container (or covered with cling film) in the fridge for 3 - 4 days. Note 1: I made the gluten free sponges in 3 batches (I had 2 cake tins on hand). One batch of white sponge, one batch of red sponge and one mixed batch. Adjust depending on the number of cake tins and the size of your oven. Note 2: Increase the amount of buttercream by ~50% if you want to completely frost the cake for a "cleaner" look, instead of the "naked cake" look. Looking for more Halloween YUM? I’ve got you covered!